Ferdinand Marcos offered the 1986 Snap Election, which proved disastrous for him and ended the Marcos Dictatorship. Due to his past successes, he was overconfident about his ability to manipulate the electoral process but this time he failed and was forced to flee, aided by his American supporter Ronald Reagan. Just like several rulers of other countries, more faithful to their foreign sponsors than to their own people, Marcos ran to the bosoms of his foreign master despite his verbal bravado then to stay and fight. Cory Aquino was used by practically everyone, by the "legal" opposition movement comprised mainly of the pre-martial law politicians, aristocracy/oligarchy, Catholic Church hierarchy and the middle class, all comprising the so-called "civil society." We native Filipinos, being more sentimental than rational, saw only her religiosity and forgot that Cory came from and is part of that aristocracy and gave her the win. Her 6 years in the presidency was the second wasted greatest opportunity for radical/fundamental changes in our homeland (the first greatest opportunity was during Marcos' rule, shrewd politicking and absolute power but we now know his real priorities). 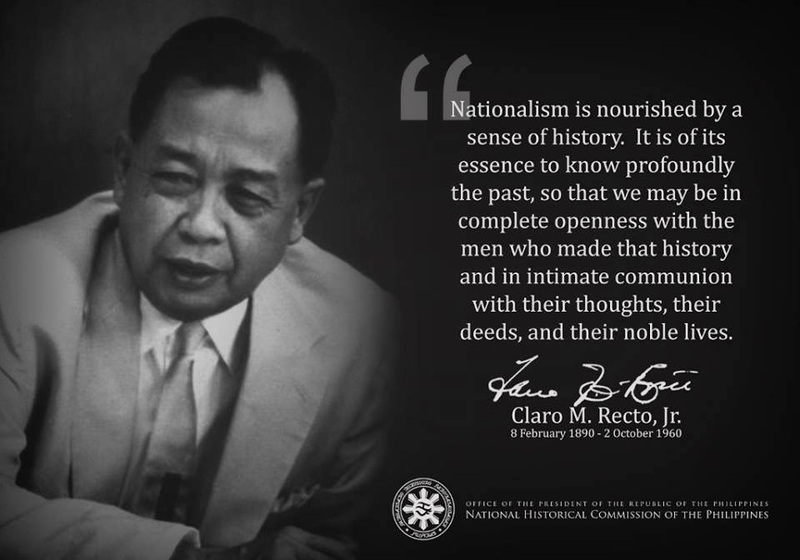 But in the end, then and now, whether Cory or Marcos, Ramos or Estrada , or Arroyo, the foreigners always win at the expense of our native, predominantly poor, majority. I do not know why many of us saw, continually see and believe that the facial change(s) in our homeland's ruling elite then as revolutionary when no one acted/acts as a nationalist : when no one among our presidents have questioned or raised the most critical issues of foreign dominance in our homeland. I mean foreign economic (include cultural) dominance via the IMF and WB, ADB, WTO and the punishments it continually brings, to include military agreements JUSMAG, VFA, etc. that we natives practically do not know and understand much about.and hidden from; when they sign agreements/treaties and laws where more foreigners (resident Koumintang and now-mainland Chinese varieties, Japanese, Koreans, Australians, etc. who logically have their own personal and national interests amid their bribes and glib talks) are given preferences in our homeland at the expense of our native majority. When agrarian reform has been legislated and proclaimed several times but never significantly implemented and instead allowed loopholes to circumvent it (compare to Cuba's Fidel Castro who after his revolutionary success, initiated real land reform beginning with his family's hacienda - which made his angry sister run to America and be beamed/used by the Voice of America propaganda radio to talk against him. )This foreign dominance is essentially neocolonialism/neoimperialism applied and practiced in our homeland. Until our rulers sincerely inform the citizenry and act against the neocolonial blueprint that they have been perennially and religiously following, they and all the contenders to public office demonstrate that they do not really care about the native majority; that by continuously keeping and fostering mass ignorance, these arrogant, slavish, salivating and thieving bunch only deserve to be put to the wall or incarcerated for life for being grave crooks and traitors. Our politicians, rulers in government, business and military work together to make all our perennial "elections" a perennial charade -- a momentary venting of frustrations and grievances, about the sad, revolting historical and current realities in our homeland. There may be icons and there may be symbols but real transformation can only take place by giving flesh and blood to people power. Only the masses can truly represent “people power” and it is high time that it is re-claimed by the people themselves. Corazon C. Aquino became the country’s seventh President on the crest of the first People Power that ousted the Marcos dictatorship in February 1986. She faced at least seven coup attempts but she stayed on until a peaceful transition of the presidency in 1992. Tita Cory – a term of endearment used by many Filipinos – came from one of the biggest landed elites but those who knew her personally attest that she lived a simple and ordinary life. The people power, that began to be associated with civilian uprisings unseating dictators in the Philippines and other countries, had its roots during the Marcos rule (1966-1986) with the upsurge of the nationalist movement and student radicalism of the late 1960s-1970s through the underground anti-dictatorship struggle until it rose as a giant wave following the assassination of Cory’s husband, former Sen. Benigno Aquino, Jr. on August 21, 1983. Since then she became a rallying figure that coalesced disparate forces, from the Left to the moderate forces with the multitude of millions aching for the restoration of democracy as well as social and economic reform. At the end of Aquino’s term, the people power forces who celebrated the EDSA 1 anniversaries dwindled to a few thousand and became less visible in the succeeding years. What went wrong? The broad democratic force that toppled the Marcos dictatorship may have installed Mrs. Aquino to the presidency but the reforms that the historic moment needed were swept aside with the sequestration of real political power from the authoritarian regime to its own remnants and a section of the elite. Meanwhile, the U.S. government, which had earlier backed Marcos, admonished the Aquino administration to reconcile with remaining key figures of the Marcos dictatorship so that policies pursued earlier, such as on the U.S. bases, would continue. The reconciliation tack, coupled with pressures arising from coup attempts that brought more power to former Marcos generals, disabled efforts by reform-minded members of the Aquino Cabinet to institute reforms in the political system, security structures as well as in the labor and peasant fronts. One after the other, they were eased out from the Cabinet. Mrs. Aquino fulfilled her promise to release political prisoners of the Marcos regime but at the same time she issued a proclamation giving immunity from lawsuit to all perpetrators of human rights violations. She tried talking peace with the National Democratic Front (NDF) but military hawks in her government brought the peace process to collapse. With militarists gaining the upperhand, Cory unleashed the sword of war against the revolutionary forces. The brutal counter-insurgency campaign began by Marcos continued under the Aquino government’s “total war” policy that was inspired by the U.S.-designed low intensity conflict (LIC) doctrine. Moreover, she reversed a covenant with progressive leaders during the last years of the dictatorship calling for the dismantling of the U.S. bases by endorsing for Senate ratification a proposed bases renewal treaty. She signed an agrarian reform act but rendered it unpromising amid legislative acts to emasculate it and by exempting Hacienda Luisita, the largest sugar plantation in Southeast Asia owned by her family, from land reform. The critical collaboration that many progressive sectors offered was further pushed back by the series of massacres of peasants and other military atrocities committed under her watch. Toward the end of her term, Aquino’s popularity rating plunged tragically. Cory Aquino’s place in history is her role as a figure that brought hope for the removal of strongman rule and the restoration of civil liberties as well as the trappings of bourgeois democracy. Whether that hope gave birth to effective reform in terms of addressing poverty and bringing about substantial change in the lives of the peasants, workers, and other oppressed classes was a dream shattered – and remains unrealized today or 23 years later. Cory had democratic leanings but failed as a social reformer. This appraisal can be explained by the fact that hope transforms into real change only if the people are empowered. Democracy works when the political leadership truly represents the patriotic and democratic interests of the people. Elite rule was unscathed even with the exit of Marcos. Today the trappings of restored bourgeois democracy such as Malacanang and Congress remain effectively under oligarchic hegemony. Divorced, however, from the constraints of traditional politics and aware of her own historic role as an “icon of democracy” private citizen Cory lent her still influential voice in various struggles against plunder, moral bankruptcy, corruption, and politically-motivated charter change. Hers became a voice in the constant search for good governance asking, for instance, Gloria M. Arroyo to do the “supreme sacrifice” of resigning in the social unrest triggered by the “Garci tapes” scandal and the NBN-ZTE scam. In many ways unlike her, most of the so-called Edsa 1 and 2 leaders and beneficiaries went back to their old ways figuring in plunder, cronyism, patronage, corruption, and human rights violations – the very same evils that trigger people’s revolts. As the lives of many people including military reformists, whistleblowers, victims of forced disappearances, and simple folk were touched by her gestures, it is as a private citizen that Cory can truly be said to have made her true mark. Her presence in protest actions helped keep the flame of people power burning unfazed by Mrs. Arroyo’s efforts to douse it off by claiming that people power is dead. Had she lived on, Cory should be a force to reckon with in the most disquieting period of power transition from the present unpopular regime to the next. A fitting conclusion to this appraisal is this quote from Harriet Beecher Stowe, a 19th century American novelist who stood against Black slavery: “The bitterest tears shed over graves are for words left unsaid and deeds left undone. ), but by economic and cultural influence. Having read a number of your articles I must say that I am impressed with the articulate and passionate manner in which you present your argumentation. I am interested in corresponding with you concerning a number of programs I developed over the course of the two decades I lived in the Philippines, whose aim is to improve the lot of the Filipino. Born in Oregon, I moved to the Philippines at the age of 25 and only returned to America at the age of 45. Marunong po ako managalog, at nakasabut ko sad ug Cebuano...ang asawa ko ay taga Leyte... at yung mga anak ko ay "Filipino-American"... kaya may karapatan din ako at responsibilidad pa to work for the betterment of the Filipino, kahit kung ako ay isang anak ng putakteng dayuhan!!! You may note a just a touch of bitterness there? I'll never forget one time hearing Joseph Estrada say in a speech on TV "walang tulung sa kapwang Filipino, kundi Filipino" and one of the Filipinos present said "kung totoo iyan; paano ba tayo?" I have attached a number of articles here I had published in Expat magazine in 2003 in order to gauge interest in the Filipino language and cultural orientation course that I was in the process of starting up at the time. There are several other specific programs that I am hoping to discuss with you and hope you'll get back to me here in order that we might begin to correspond. Only Cory herself will understand herself and give justifications for her actions. Like you and me,she sees differently. She is not empowered because she lacks political will. She also fears the punishment of her bourgeiosie class. i think she is acting according to what she thinks is 'best' and according to her limitations. She is never a hero because a hero can defeat her self interests and move the barriers that seem to block his or her way to freedom and achieve what she wants. Cory is like many of us - entrapped.The possibilities are endless. It is possible to do everything under the sun, but there is no perfect formula, even superman can bleed. There are no real superheroes only men brave enough to face one obstacle in his lifetime just so happens that others are watching. Some become consistent in this behavior, but not all of us. Blame the system, achieve nothing. We have no choice but to live life and fight whatever we want to fight in life - to survive, to find meaning, to die peacefully. We cannot unite everyone. there is no superior goal. Who would want freedom? not all. In the end life hands us limited cards we just have to play with. if you want to influence others on your goals go ahead and do that. I may or may not join you. Godspeed.